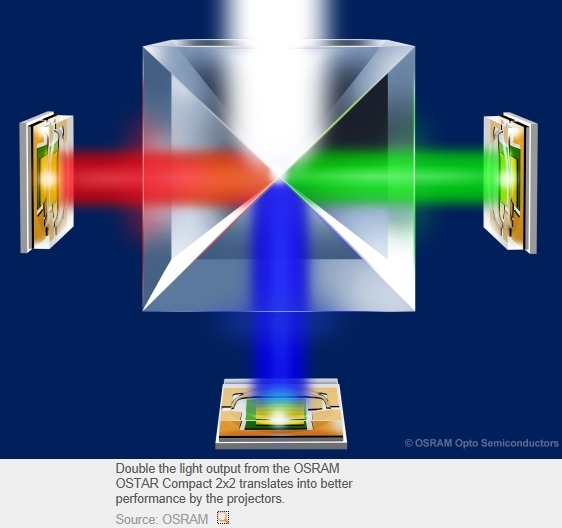 OSRAM Opto Semiconductors has added another LED to its portfolio for projection applications. The new OSRAM OSTAR Compact 2x2 is the brightest LED of its type on the market. With twice the brightness in all colors and near record-breaking green values this new version is an excellent addition to the existing Compact versions. Its high performance makes it ideal for high-power projectors for the commercial and domestic sectors. LEDs in the OSRAM OSTAR Compact series now offer even greater flexibility for projectors thanks to the new 2x2 version. With just one set of Red, Converted Green and Blue it is possible to achieve a luminous flux of 400 lm from the projector. The new version has been designed specifically for imager diagonals between 0.4 inches and 0.55 inches. If multiple sets of the LEDs are combined for larger imager diagonals the high projector brightness levels needed for office applications can be achieved. The compact LED offers the best ratio of light to size. With dimensions of 5.8 x 4.6 mm and an output of 85 lm per mm² of footprint it is the brightest LED in this package class on the projection market – measured in pulse mode for green at an operating current of 6 A. It contains two 2 mm2 chips and produces twice the output of the standard Compact LED with one chip. The package is available in Red, Converted Green and Blue. In Converted Green, for example, the LED has a typical luminous flux of 2400 lm in pulse mode at an operating current of 6 A. No other comparable LED has achieved this before. This enormous increase in output is based on the two integrated blue chips in state-of-the-art ThinGaN technology and the green phosphor converter. Since a greater proportion of green than red or blue is needed to produce white light, the increase in the brightness has a significant effect on the overall system brightness of the projector.